NOTE: Volunteer internship invited…broad education in sustainability opportunity for 3-6month intern with farming or similar skills. Potential long term position. Dandelion Sustainable Farm is a gift to Nature, Humankind and the Living Force of Life Itself. Whole Body Sustainable living serves world peace and a benign future for us all. Love is a mysterious and powerful force. For 40 years it has moved Candace and Loren Stolley to create this unique gift of their all to all. In 1979, after years of self sufficiency experience, the heart inspiration came to the Stolleys to create Dandelion Sustainable Farm as a profound gift of their lives as service to the Heart of Existence Itself, a gift of their energy, skills and resources. It was to be a gift of all they had and could do. From the sale of their small newly finished artist dream home, miraculously, sufficient funds came to purchase pristine land in Northern California and to begin the work. Fresh air, a high clean water table, deep rich farmland and wooded rolling hills made the land a choice location. With seasonal creeks, beautiful views and miles of hiking trails, 190 acres were, from the beginning of Dandelion, a spacious, peaceful place. Dandelion Sustainable Farm is not for profit. It is intended, with research and demonstrations to provide education in all forms of sustainable living. May the work here serve a rapid switch to sustainable choices in every area of our lives, as is becoming so critically necessary. Our work on Dandelion Farm over the past 40 years has finally come of age. Our orientation and efforts to serve the collective future, humans, non humans and of our entire earth’s well being has bloomed into a broad gift of help for others to embrace sustainability as a necessary way forward and essential foundation for world peace. 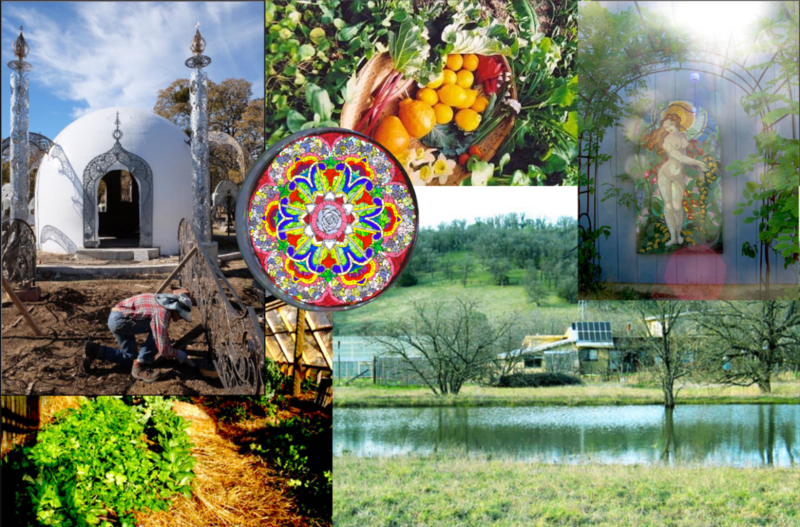 More details about the variety of sustainable life lived on Dandelion Farm can be found under “Farm Sustainability”. While food, health, home, and energy, etc, are essential needs we must meet and work to do so sustainably on Dandelion Farm, our beings also need to be lifted and inspired beyond rudimentary survival. Simply to life is not sufficient. The whole being needs nurturing toward well being, and fullness. We need a humanizing life that can serve a truly benign future. Thus sustainability on Dandelion includes an orientation toward Wholeness: whole and wholesome fresh food, whole healthy balanced environment from soil microbes to bugs and birds (and so much more) and the whole human. The whole human orientation includes cultivation of metal clarity and critical thinking, emotional self responsibility beyond negative reactivity, physical balance and health, personality balance beyond self created limitations, tolerance and brotherhood on inner life and more. Inner fullness overflows into artistic creativity naturally, as playful whimsy and deeper heart expressions to adorn our lives. Thus visual arts (and cultural arts occasionally), have become prolific on Dandelion. These serve to raise up and inspire a full, rounded sustainability movement that embraces the higher gifts of human culture and benign technology for earth’s future enrichment. Love is the profound essence of the deeper heart and beauty is its spontaneous expression, calling all to our essential unity at heart. May the art on Dandelion Farm move others toward higher and sustainable choices that serve this heart unity and the well being of all life. “Plant Lust”, a green house add-on, is amazingly productive! Common and unusual greens we grow, (often considered WEEDS!) are great for yummy smoothies, salads, or cooked. We can feel their healthful benefits, a key part in our sustainable diet. A great deal of our research has been into GREENS and those edible weeds, for their promising potential to feed a hungry planet. They grow faster on less fertility than other foods providing broad optimum nutrition. Our many years of farming have been full of endless experimentation. While using our personal lives for these experiments for a sustainable plant based diet and whole body health, much of the research, has been for the future of others. It would be difficult to innumerate all the usual and unusual plants trialed for future food under various climate change possibilities and all the means for healthy fertile soil, all the ways of processing foods for optimum health, all the alternative technologies, etc, trialed. A primary focus has been developing an easily grown (zone 7-8) wholesome plant based diet for food security and optimum health. The diet must collaborate gently with Nature, broad enough for optimum health and be easy to grow . Likewise better ways to cultivate soil fertility on site strengthens food security and growing systems that conserve CO2 are essential for our collective future. As the years have progressed in these experiments we are enjoying better health and far more productivity in less growing space, less use of precious water and many signs of a more balanced local ecosystem. We have also observed the benefits of using our saved seeds, from adaptation of more challenging plants, to greatly increased vigor of easier plants. Experimentation with unusual food plants is also to help address the on going massive loss of food varieties available to humanity. Dandelion Farm nurtures the deeper being, attracting the heart and speaking there of inner and outer peace, harmony and well being via the language of art and nature, kindness to creatures, openness of expression and service to our world at a critical time in its history. 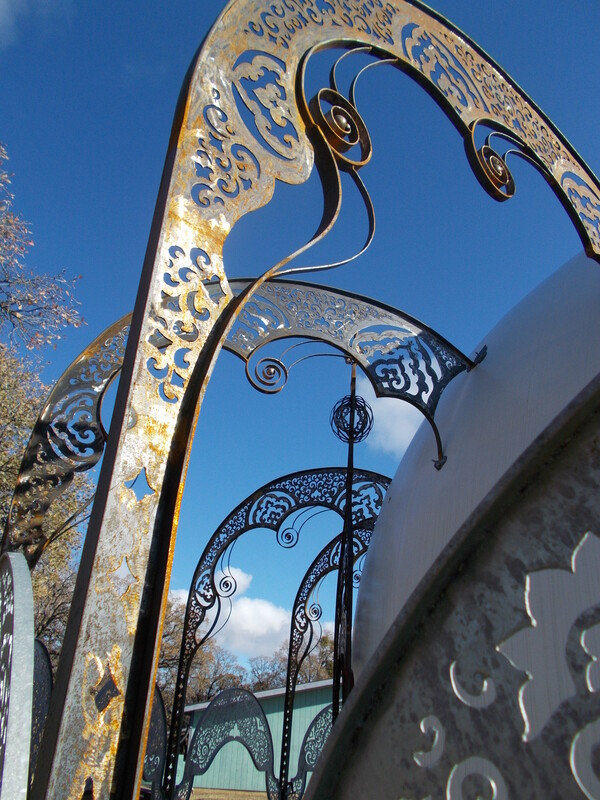 Great Swan Peace Cathedral is our culminating gift to the world on Dandelion Farm in service to world peace. It is requiring everything of us, a huge endeavor and great Leap of Faith to accomplish this. Will you participate? We are all part at a pivotal moment in human history. 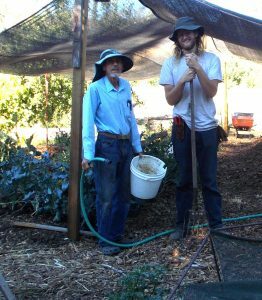 Thus we feel urgent to share our long (50+ years) of sustainable living experience and knowledge as education on Dandelion Farm. May it help the necessary transition humanity faces to survive and achieve world peace. This dimension of Dandelion Farm is most associated with Great Swan Peace Cathedral. Great Swan Peace Cathedral is a vision becoming manifest, a crowning gift to the world on Dandelion Farm. (see GreatSwan.org for this story). Much of the art work has been accomplished, almost entirely by Candace with broad technical and installation support from Loren Stolley, while much still waits to be created. Now, in early 2019, Great Swan Peace Cathedral stands a resplendent taste of the vision that called it into being. There are many embellishments yet to come to enhance the fullness of that vision. But from this point forward, Great Swan stands already visually expressing its rarefied origin, beckoning all to sublimity and heart exaltation. Sustainable living is our long developed lifestyle. We eat from our gardens, grapes, berry patch, orchards and sell what is excess. After 40 years, the excess food from healthy soil and perennial fruits can be overwhelming indeed at times. Maintaining all this including the buildings and systems on Dandelion farm while working to further the inspiring sign of Great Swan Peace Cathedral is a daunting task. Volunteers learn a great deal while helping in so many ways, from gardening to natural building, and numerous skills for maintenance. 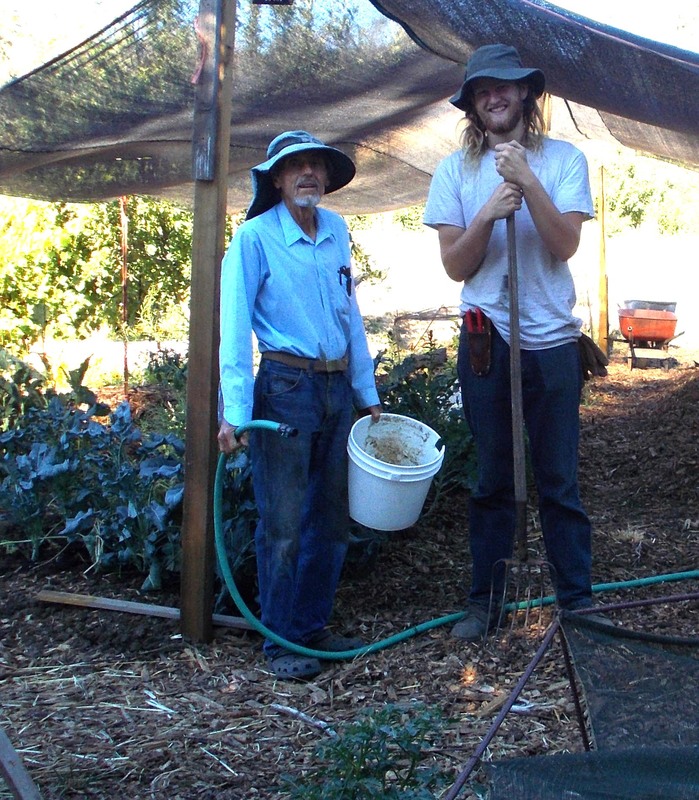 Become a participant in our farm family, helping in exchange for room and a food stipend! Mighty tall Noah was an incredible help with mulching, one of his favorite forms of exercise. Volunteer Shawn was a humble brilliant very young MIT inventor, dedicated to creating “low technologies” to help the world’s poor. And that is what he is doing in a big way still! Many wonderful people have helped in many ways on Dandelion Farm, volunteering their energy, enthusiasm and skills in exchange for their stay. It is a rich human sharing and educational experience for all. Is there a way you could help? Volunteers with special skills make their mark on Dandelion…Tiny house builders welcome! Want experience with cob natural building? 2012-2013 Ivory Tower, a cob cabin, (made of mud and straw with an old satellite dish roof) is located in Enchanted Encampment, our mini educational eco-village in the making. We hope to complete this cozy little art cabin soon. Tiny houses for camping while inspiring recycling and creativity is one of our delights. Many more playful little sleeping places being dreamed and stared. 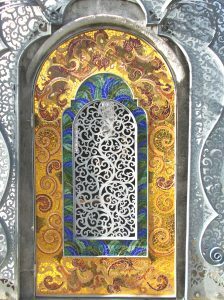 Winged lion mosaic windows are part of the MANY art adornments of Dandelion Ballad (“A song to the Heart of all”). This is the educational center of Dandelion that is nearing completion! Stefan and Jennifer, superb artists, stand by their fabulous paint job on Sentinel Fire as there farewell day offering. 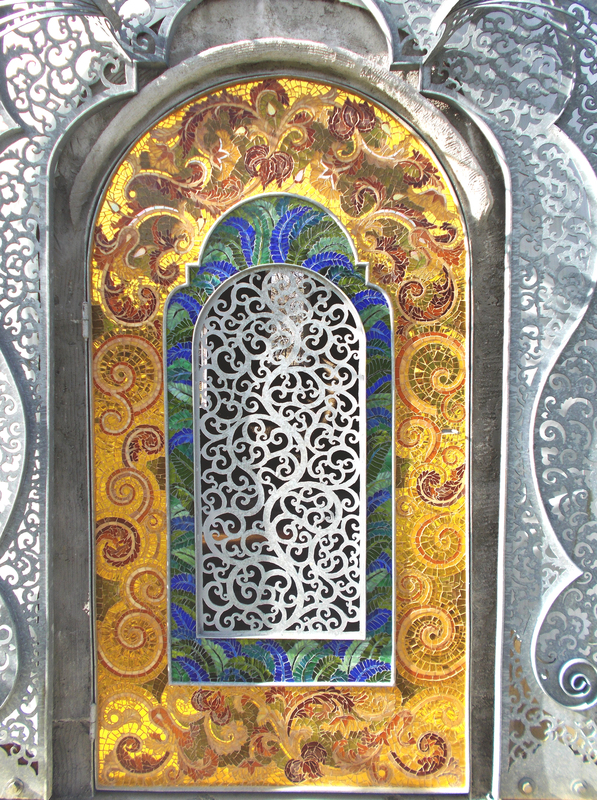 Their color job transformed the metal art from a drab to a knock out piece. They were especially heroic in our epic 2012 apple and walnut harvests. Oh, for more of that wonderful color talent help! 4 great volunteers that helped us greatly in 2007 and had a blast together. Notice 18yr. old Ansel on right. Below: Ansel 6 years older and still vastly ahead for his 24yrs, returns to Dandelion from Arkansas for a New Year’s visit. With him is the lady of his life, a beautiful Ginny (body and heart). Ansel spent several months in ’07 getting the landscaping of the center of Dandelion well under-way, teaching us how to do it and making himself another well loved member of the Dandelion family. He was a good man in the true sense of the word, even then at 18! Below, students come by the busload for a day of help and fun together on the farm. Volunteering: Please consider our work exchange program and internship possibilities on the next “Learn From Living” page. Support Dandelion With a TOUR of the farm…These include 1hr. mild hike/tour + 1hr. question/answer. $10/person, $50 minimum. Bring a group! Dandelion Farm is tobacco, drug and alcohol free. Please help us keep Dandelion a healthy environment for all.